This week, again in the throes of the Polar Vortex (unaware at press time if any of the tracks involved in our choices have cancelled), we cover the aptly titled Blizzard Series Final at Woodbine on Jan. 31. It’s an early season highlight as we roll into February. There is plenty of racing this weekend, however, weather permitting, and regardless of the sports’ world’s focus on the Super Bowl on Sunday. Our overnight events, specially chosen races, present highly probable profit-producing fields and our horses-to-watch (H2W) list, both which have been productive as 2014 heads for its second month. Please note that horses from our featured overnight events the week before appear on the H2W list as second-time members if they did not win when we highlighted their previous race. 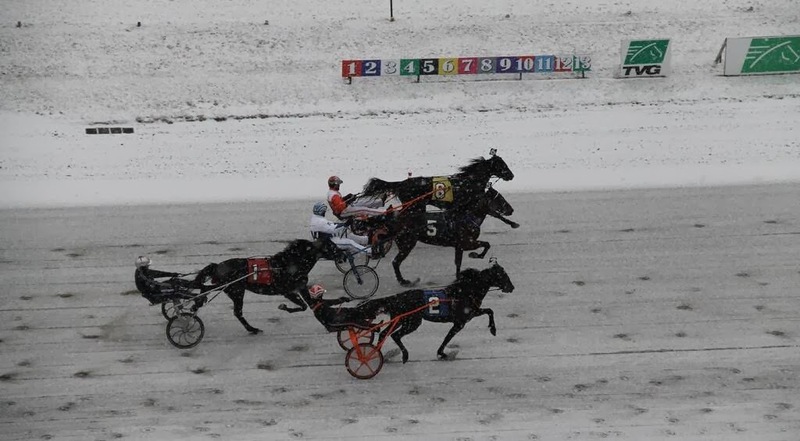 It should come as no surprise that the second leg of this two-leg series for three- and four-year-old filly and mare pacers was raced in a sheet of falling snow so strong that it clouded the call of the races. Now the $34,000 final field leaves the gate at Woodbine on the last night of January, hopefully, as the weather dictates. The short series has been packed with entries and the first or second favorites have won all but one edition, which was taken by a 4-1 shot. Looking for an outside contender here, however, appears simple. Not one of the choices in all the prelims repeated a victory, so it is possible that one that has been abandoned may be the key. We see that one as Zip Car. In the second division of leg one Zip Car was sent off a little more than 3-2 and finished second as the public choice. It was a fertile trip as she left, dueled wide, got the top, extended her lead and lost by a mere neck to the second choice at the wire. The next week, in leg two, from post 9 she was sent off at 68-1. She hardly participated in that event and yet she shows up in the final, drawing the outside again. Whatever the strategy her trainer and driver decide to use, she is going to be a factor in this race and the kind of factor that can upset a field that comes to the final with no dominant femme. Also taking a shot in the final after a few tough trips is Stoneridge Classy. She made a huge brush in the snow, gaining 5 lengths and unable to find the wood afterwards and was MIA with the rest of the group with the snow at the three-quarters. She should play a role in the exotics and is also in a good spot to upset. Together, these two, with forms of success, will storm the toteboard in the Blizzard final. Friskie Pants was active on our H2W list a few back and though he was competitive he didn’t win. However, he comes back to his most successful level of late and goes into the 4 hole while dropping down. He has the kind of speed that can make a front-pacing win possible and he has the ability to sweep and go the distance late. Here he may take the first option and if he makes it we should be looking at a great price. The first two morning-line (ML) choices, coming from posts 1 and 2, will find a challenge from outside-contender Wild Ride. His ML is 15-1 for reasons unexplained to us. This Ontario-bred has made a good home in Ohio and raced lightly towards the end of last year, not doing badly against better horses than this group. Given his probable odds, which may make him the third choice at best, he is the bet here to be on top or close enough to spook the first two choices (certainly the 1 horse), resulting in a firm win price for us. It’s time to play “Beat Palone” again at the Pittsburgh-area track and this is a great race to do it, considering he will be driving the top choice, the ML favorite from post 4, and sucking in the majority of win-mutuel dollars. You may be able to beat the popular driver’s mount with obvious-second-choice D Mac but a better price should be available for Double Dribble. This gelding will go under the betting radar and perform far better than the public allows its chances. You can toss out his sloppy mile dropping into this class and the race before that where he stepped up two levels after winning in the one below this. In other words, he belongs here after his win on Jan. 10 and is positioned to make Palone slayers happy with a great win price. A quick note: Schoolkids, once a viable sophomore in the top level and now eight, is looking for a level to suit him and is, oddly enough, trained by the other Palone, Mike. Don’t hesitate to put this guy in exotics if you are looking for a pumped up price because once he finds a spot he may find it in him to make a few more bucks for his connection before retiring (notice he is a winner of almost $1 million). 2/1/14; Eighteen R2; Safe Harbor R7; Dinner Guest—AE—R7; Lightning Strike R12.